1. Bishop Gorman (7-2, Last week 1) — Will the Gaels win another league title? Stay tuned. 2. Liberty (7-1, LW 2) — The Patriots clinched their seventh league title in eight years last week. 3. Arbor View (7-0, LW 3) — The Aggies have secured their fourth straight league title. 4. Green Valley (7-1, LW 4) — A win against Foothill guarantees a home playoff game. 5. Foothill (7-1, LW 5) — A win against Green Valley guarantees a home playoff game. 6. Faith Lutheran (5-3, LW 6) — After starting 0-3, the Crusaders finished with five wins and a No. 2 seed in the Northwest League. 7. 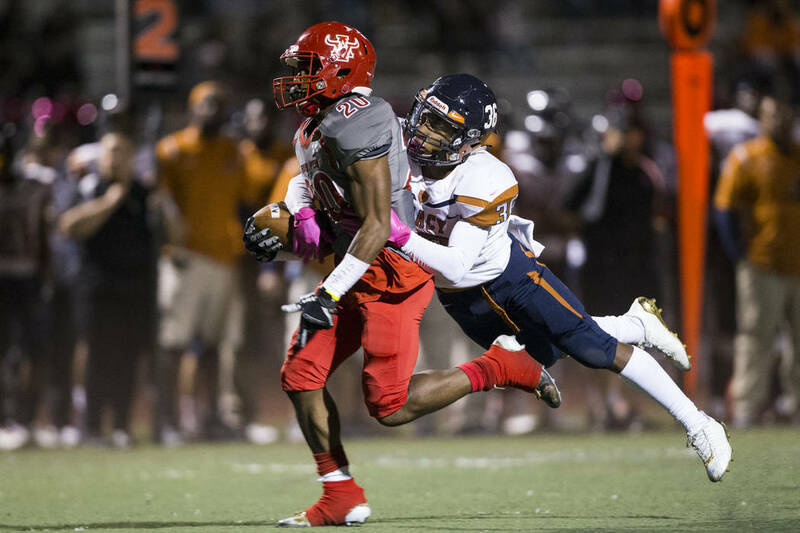 Sierra Vista (6-1, LW 7) — The Mountain Lions will look to be the first Nevada team to score on Bishop Gorman. 8. Legacy (5-3, LW 8) — Win this week and the Longhorns are in the playoffs. 9. Canyon Springs (4-4, LW 10) — With the top seed in the Northeast League wrapped up, the Pioneers host Rancho. 10. Palo Verde (4-4, LW unranked) — After a 1-3 start, the Panthers can sneak into the playoffs if the tiebreakers fall right. 1. Desert Pines (5-2, LW 1) — After not scoring in their first two games, the Jaguars have outscored opponents, 175-13. 2. Mojave (6-2, LW 2) — The Rattlers look to secure a home playoff game with a win against Pahrump Valley. 3. Moapa Valley (6-2, LW 4) — The Pirates are idle and will wait to see their seeding. 4. Chaparral (7-2, LW 5) — The Cowboys regular season is finished, and will see where they land seeding-wise. 5. Virgin Valley (5-3, LW 3) — A win against Del Sol gives the Bulldogs the Sunrise League title. They fall to fourth with a loss. 1. Needles (8-0, LW 1) — The Mustangs look to secure a perfect regular season with a victory at home against Laughlin. 2. Lincoln County (6-3, LW 2) — The Lynx want a playoff game in Panaca, and a win against Democracy Prep will get them there. 3. Lake Mead (5-2, LW 4) — The Eagles look to secure a postseaon berth for the second year in a row. 4. Democracy Prep (4-3, LW 3) — With a playoff spot clinched, the Blue Knights are playing for seeding. 5. The Meadows (3-5, LW 5) — The Mustangs need a win and some help to reach the postseason. 1. Pahranagat Valley (8-0, LW 1) — The Panthers can secure the top seed in the Southern Region with a win. 2. Spring Mountain (5-2, LW 2) — With a win the Eagles would host a first-round playoff game. 3. Beatty (5-1, LW 3) — If the Hornets beat Pahranagat Valley, there’s a chance they would be the top seed. 4. Tonopah (5-4, LW 4) — The Muckers clinched a playoff spot last week. 5. Indian Springs (1-6, LW 5) — The Thunderbirds finish the season at Beaver Dam.